An afternoon with this book just might transform you into the most avoided person in the room.. I picked up this book because of the title. I was excited to read it. I wanted to love it. I made a mistake. I found FREAKONOMICS lying around the house, hmm... same authors. I cracked it open. I didn’t love it. I liked it — maybe because I felt I was supposed to, the cover did after all tell me to “be prepared to be dazzled.” I’m sure many readers were. ...missing what life is all about, being human. 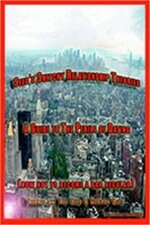 The theories of the Author’s are at times compelling — no, not compelling, somewhat interesting, at best. How can I say that: 7-million copies sold, tell me: I don’t know much? I like numbers, maybe love, but sometimes my OCD need to quote statistics may actually bore the crap out of anyone I spew them at, so I refrain. That’s the challenge with number lovers: they believe they are living in the world of non-fiction when actually they are writing fiction that will only turn into ‘NON’ if their predictions end up ringing true. 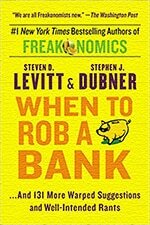 There is no doubt: Dubner + Levitt are brilliant analytical minds. Without question: they can write. And definitely: there is a large audience for their words. As for me, I found the book to be somewhat tedious, and since it is not about any individual’s life, the material can quickly become dated; the half-life, short. The book came out in 2015 — I finished it in 2017 — maybe I missed the prime reading window. What I did find with WHEN TO ROB... unlike FREAKONOMICS, the material was broken into sections. This made it a difficult read. If a section didn’t grab my interest it was laborious to read. I READ ON. It felt like the waning interest of Year 3 of University as opposed to the excitement of Year 1. I was going to give the book only 3 Stars — because it happens to have the odd delightful moment. That all changed when I hit Chapter 11: Kaleidoscopia. This is when, for me, the book became interesting. Instead of the organized chapters, it flowed freely. If I didn’t like a theory, not to worry, like a song on the radio, wait 3 or 4 minutes, and a new one would play, in this case: a few pages later. I found this to be far more enjoyable than the organized first 10 Chapters. But, still, this only brought my rating up to a 4. Then, right near the end, Mr Levitt shared a heart-wrenching story: When a Daughter Dies. Immediately, this raised my rating to 4.5 — well above 5 for this section. Mr Levitt took the economist out of being an economist by sharing something immensely powerful and personal. I thank him for sharing. Writing “well above 5” makes me feel like a bit of a... anyway, thanks again, for sharing. 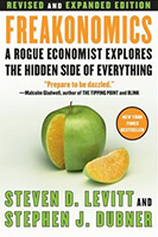 I liked FREAKONOMICS. At first I thought I would love it, mostly because it turned on my thinking cap; however, the more I read, the more I realized it wasn’t really saying anything logic wouldn’t open one’s mind to if they thought about the subject matter in the first place. The authors claim there is no unifying theme in the book. I could go on about the other topics discussed in the book such as; gang hierarchy when it comes to the inner city (Chicago) drug trade; the discussion on whether Real Estate Agents work in our best interests; how when teachers are given bonuses for Standardized Testing Scores, if their students score high -- do they cheat? And, the economic ramifications of having a non-white name, but I won’t -- I think this paragraph goes a long way to highlight the unifying theme of the book: The socioeconomic gap between race and culture. Interesting subject matter — but not dazzling. Having said that, I enjoyed the book, for the most part, I found it to be a good read. I loved the section where the authors talk about life being a tournament... I suggest you read the book to find the wisdom and life lesson for yourself! In conclusion: I’m glad went to class. But in the end, I was happy my schooling ended.